Well, it wasn’t my intention to post two shrimp recipes in a row, but hey, it happens. And after all, shrimp is delicious. And yesterday was a burger. Today…tacos! Totally different animals, so-to-speak. I love shrimp tacos. I probably have 5 or more variations of spicy shrimp tacos, and even though they all have similarities, they’re all a little different. And all so very delicious. These are no different. What really makes them though, is the slaw. Cilantro, green onions, garlic, lime juice, and Greek yogurt. Um, yes. Yes, please. 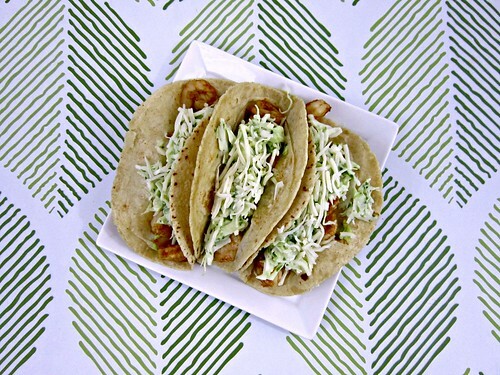 And of course, the shredded cabbage gives the tacos a nice crunch. A little bit of spice – though I didn’t think they were spicy at all, but I’m a spicy kinda gal – with some creamy mashed avocado, creamy, tangy slaw, and of course a little cheese. That, my friends, is taco heaven. I mean, just look at it. How can you not want to reach through the screen and grab those? And devour them immediately. I’ll tell you that I was mighty sad when I was done eating and there were no more delicious little shrimpies in the pan. I learned a long time ago that a pound of shrimp doesn’t go very far for me and J. You’d think I’d remember to double it, but I seem to always forget. Sad panda over here. We got four stuffed tacos out of it, so take that information and apply it to your situation…if you need more tacos, I would double the shrimp. Like I should have. We had a good bit of slaw and extra sauce leftover, so we could have easily had another pound of shrimp and plenty of toppings to go with it. Don’t miss out on these amazing shrimp tacos, and make plenty so you aren’t left staring sadly at an empty skillet, wishing there was more!! Place all of the sauce ingredients, except the Greek yogurt, in a food processor and blend until smooth. Add the Greek yogurt and pulse again until smooth. Taste and adjust seasonings as necessary, then set aside until ready to use. Place the shrimp in a large bowl. In a separate bowl, combine the chili powder, cumin, southwestern seasoning, and cayenne. Sprinkle the seasonings over the shrimp and toss to coat. Add the shrimp to the skillet and cook for 2 minutes, then stir or flip and cook for an additional 2 minutes, or until cooked through. In a large bowl, place the cabbage and add sauce, a little at a time, until it is coated to your liking. Don’t add it all at once, it will likely be too much and make the cabbage soggy. Smash the avocados with a fork in a bowl, and season with salt and pepper to taste. I like to add a good squeeze of lime as well. 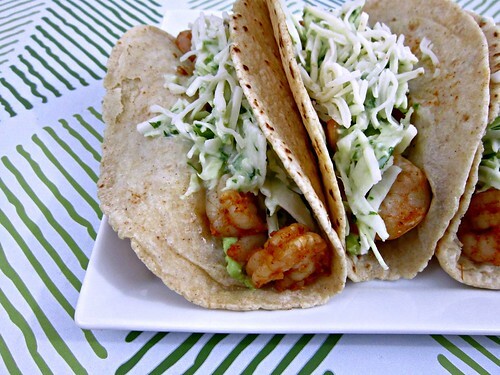 To assemble tacos, warm the tortillas, smear a good spoonful of avocado on the tortillas, then top with shrimp, garlic cilantro lime coleslaw, a drizzle of the left over sauce if you like, shredded cheese, and a squeeze of lime juice.